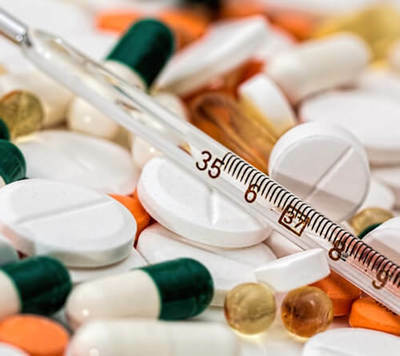 Synopsis : List of drugs including generic and medical products that have received recent United States Food and Drug Administration approval. The United States Food and Drug Administration (FDA or USFDA) is an agency of the United States Department of Health and Human Services, one of the United States federal executive departments, responsible for protecting and promoting public health through the regulation and supervision of food safety, tobacco products, dietary supplements, prescription and over-the-counter pharmaceutical drugs (medications), medical devices, electromagnetic radiation emitting devices (ERED), vaccines, bio-pharmaceuticals, blood transfusions, veterinary products, and cosmetics. The FDA regulates more than $1 trillion worth of consumer goods, about 25% of consumer expenditures in the United States. This includes $466 billion in food sales, $275 billion in drugs, $60 billion in cosmetics and $18 billion in vitamin supplements. Much of the expenditures is for goods imported into the United States; the FDA is responsible for monitoring a third of all imports. The programs for safety regulation vary widely by the type of product, its potential risks, and the regulatory powers granted to the agency. For example, the FDA regulates almost every facet of prescription drugs, including testing, manufacturing, labeling, advertising, marketing, efficacy and safety, yet FDA regulation of cosmetics is focused primarily on labeling and safety. Photo of assorted drugs with a body temperature thermometer. Receive extensive scrutiny before FDA approval in a process called a New Drug Application or NDA. New drugs are available only by prescription by default. A change to Over the Counter (OTC) status is a separate process and the drug must be approved through an NDA first. A drug that is approved is said to be "safe and effective when used as directed." Are chemical equivalents of name-brand drugs whose patents have expired. Generally they are less expensive than their name brand counterparts, are manufactured and marketed by other companies and, in the 1990s, accounted for about a third of all prescriptions written in the United States. For approval of a generic drug, the U.S. Food and Drug Administration (FDA) requires scientific evidence that the generic drug is interchangeable or therapeutically equivalent with the originally approved drug. This is called an "ANDA" (Abbreviated New Drug Application). Are drugs and combinations that do not require a doctor's prescription. The FDA has a list of approximately 800 approved ingredients that are combined in various ways to create more than 100,000 OTC drug products. Many OTC drug ingredients had been previously approved prescription drugs now deemed safe enough for use without a medical practitioner's supervision. The FDA's federal budget request for fiscal year (FY) 2012 totaled $4.36 billion, while the proposed 2014 budget is $4.7 billion. Since the Family Smoking Prevention and Tobacco Control Act became law in 2009, the FDA also has had the authority to regulate tobacco products. The FDA regulates almost every facet of prescription drugs, including testing, manufacturing, labeling, advertising, marketing, efficacy, and safety. The FDA has a list of approximately 800 approved ingredients that are combined in various ways to create more than 100,000 OTC drug products. Cosmetics are regulated by the Center for Food Safety and Applied Nutrition, the same branch of the FDA that regulates food. Prior to the 1990s, only 20% of all drugs prescribed for children in the United States were tested for safety or efficacy in a pediatric population. The Center for Veterinary Medicine (CVM) is the branch of the FDA that regulates food, food additives, and drugs that are given to animals, including food animals and pets. The Center for Devices and Radiological Health (CDRH) is the branch of the FDA responsible for the premarket approval of all medical devices, as well as overseeing the manufacturing, performance and safety of these devices. The FDA regulates more than US$1 trillion worth of consumer goods, about 25% of consumer expenditures in the United States. This includes $466 billion in food sales, $275 billion in drugs, $60 billion in cosmetics and $18 billion in vitamin supplements. Much of these expenditures are for goods imported into the United States; the FDA is responsible for monitoring imports. The FDA has its headquarters at Rockville, Maryland and has 223 field offices and 13 laboratories located throughout the 50 states, the United States Virgin Islands, and Puerto Rico. Generic Version of EpiPen Approved by U.S. FDA - Teva Pharmaceuticals USA gains approval to market its generic epinephrine auto-injector in 0.3 mg and 0.15 mg strengths for emergency treatment of allergic reactions in adults and pediatric patients who weigh more than 33 pounds. Scammers Target Consumers with Fake FDA Warning Letters - U.S. FDA warns consumers about criminals forging FDA warning letters to target people who tried to purchase medicines online or over the phone. FDA Approves Glucose Monitoring System with Sensor and App for Adults with Diabetes - FDA approves continuous glucose monitoring system with a fully implantable glucose sensor and compatible mobile app for adults with diabetes. Automated Insulin Delivery and Monitoring System for Younger Pediatric Patients Approved by FDA - FDA approval of MiniMed 670G hybrid closed looped diabetes device to automatically monitor glucose and provide appropriate basal insulin doses for individuals aged 7 to 13 with type 1 diabetes. US FDA Authorizes First Fully Interoperable Continuous Glucose Monitoring System - US FDA has permitted marketing of Dexcom G6 integrated continuous glucose monitoring (iCGM) system for determining blood glucose levels in children aged 2 and older and adults with diabetes. Citation: Disabled World. (2018/07/03). U.S. FDA New Drug and Product Approvals. Retrieved 2019-04-18, from https://www.disabled-world.com/medical/pharmaceutical/fda/ Direct Link: U.S. FDA New Drug and Product Approvals - List of drugs including generic and medical products that have received recent United States Food and Drug Administration approval.